BYU wildlife professor Tom Smith and his students are tracking polar bears in Alaska--even getting inside their dens--to determine how the reduction of sea ice is impacting the bears. 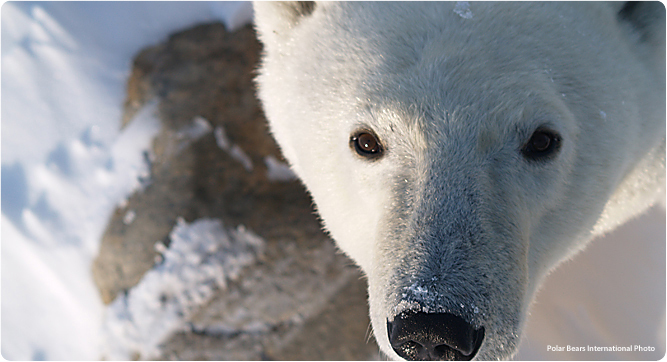 See the inside of a polar bear's den. This Fourth of July means more to history professor Mark Choate after eight months in Afghanistan. Read the Bronze Star recipient's thoughts on freedom. With sustainable-sushi and urban-farming stories, BYU became the first school to sweep the broadcast awards at the Hearst journalism championships. Neuroscience/exercise science major Miles Batty, the NCAA Indoor Athlete of the Year, is also the Academic All-America of the Year. He maintains a 3.95 GPA. Some people form weak, parasitical relationships. In a BYU Alumni webinar, networking expert Jeff Rust offered tips for building symbiotic cities of influence. Expand your world: like us on Facebook, follow us on Twitter, and join us via RSS, E-News, and our blog. A BYU tool provides important info, tips, and guidelines that can help you plan a safe and enjoyable trip abroad. The Teacher Education Research Seminar group has met bimonthly for 10 years to help faculty get published. On a Fulbright in Uganda, one professor is discovering, and blogging about, what can feel like insuperable barriers. Through a new BYU exchange program, McKay students can experience diversity in a foreign school system. Associate education leadership professor Ellen Williams presented on how to coach frustrated or frustrating teachers. Despite the loss of the Provo Tabernacle, where BYU's annual Adventsingen was held, the holiday tradition will continue. Linguistics professor Lynn Henrichsen explores how the Church has coped with linguistic challenges. See the sustainable technologies BYU engineering students developed for and introduced to Peru's Islands of the Uros. Watch BYUTV's Insight to learn how chemical engineering professor Tom Fletcher's research combats wildfires. A new Web tool compares computer and electrical engineering programs in the United States. A team of BYU students turned an electric motorcycle into a hybrid and increased its range by nearly 40 percent. New BYU research shows that people from red and blue states may agree more than they disagree on political issues. Certain types of dads remain a force for good for children who have moved out, says new family life research. A student-professor team's study of religion and teens underlines the importance of relationships. The benefits of marriage, according to a new BYU study, include increased odds of surviving colon cancer. See how the first joint public performance of BYU and the Beijing Dance Academy brought a BYU professor full circle. Finding music in city noises, associate professor of music composition Steve Ricks won a prestigious commission. In his June devotional, plant and wildlife sciences chair Val Anderson shared how he fought fires. Listen to it here. Assistant biology professor Steven Johnson collaborated with a Stanford Nobel laureate to improve gene therapy. Professor Barbara Mandleco coauthored a pediatric nursing book full of nutrition specifics and cultural considerations. Departing with words from Elder Richard G. Scott, nursing grads left BYU prepared to take on life and love it. See what alumna Penny Jensen, president of the American Academy of Nurse Practitioners, told graduate students. Members of the Fritz B. Burns Foundation joined BYU in a celebration of Burns scholars across campus. Watch the Swedish Fish experiment BYU chem majors put on for local students in the second annual Open Lab Day. Wish you could watch Jimmer from any angle? A professor's new software gives sports-television viewers the wheel. William Christensen, associate professor of statistics, is using statistical tools to study climate change. What should a Mars rover be able to do? See how the BYU rover fared in competition in Utah's red, Mars-like desert. In a story on justices' use of the dictionary in the courtroom, the New York Times cited an article written by a BYU law student. Read the op-ed BYU law professor Shima Baradaran penned for the New York Times about reducing prison populations. Associate Dean Gordon Smith will join an Association of American Law Schools committee on Transaction Law and Skills. What do businesses do when competitors offer similar products for free? BYU faculty share advice. Professor of finance Hal Heaton has been appointed the new faculty director of the H. Taylor Peery Institute. Utah high schoolers put their Spanish and marketing skills to the test in BYU's Business Language Competition. A class project turned into a winning business for student Saul Howard in the Crexendo Website Competition. A new exhibit is a who's who of American painters from the 1700s to the 21st century. Hosting the Papyrological Summer Institute, the library is displaying ancient artifacts. See BYU Studies' three new books; one is about a Dane who helped settle Bluff. See what people are saying about Education Week's 1,000-plus classes--and enroll.